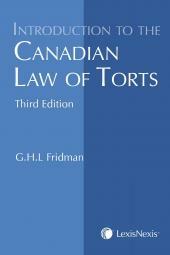 In this book, Fridman presents an informative background to the law of torts so it can be better understood and appreciated by those who may find themselves somewhat confused as to its true nature and scope. Consisting of a number of independent essays that raise and discuss ideas which permeate the modern content and function of the law of torts, this book aims to stimulate the interest of readers and to encourage them to further examine this complex topic. The distinction between tort law and criminal law in relation to the "guilty mind" of the perpetrator committing the act or offence, various categories of guilt in tort law and their evolution, and the evolution of liability without guilt and the "mindless tort"
The Late Professor Emeritus Gerald Fridman, Q.C., F.R.S.C., M.A., B.C.L., LL.M., Hon. D.C.L., was one of Canada’s most respected and influential legal scholars, and a prolific author of more than a dozen legal texts and more than 100 articles, major papers, case notes and book reviews. He was renowned in the fields of contracts, agency, torts, sale of goods and restitution. His work has been cited in more than 50 decisions of the Supreme Court of Canada and in hundreds of lower-court decisions. 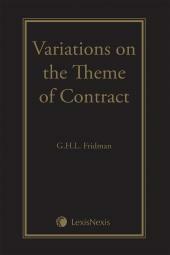 Professor Fridman studied law at St. John’s College in Oxford, and he held a B.A., B.C.L. and M.A. from the University of Oxford and a Master of Laws from the University of Adelaide in South Australia. In recognition of his extraordinary legal career, he was conferred an honorary Doctor of Civil Law from Western University. Professor Fridman was admitted as a barrister-at-law in the Middle Temple in London, England and as a barrister and solicitor of the Supreme Court of South Australia, and was called to the bars of Alberta and Ontario. He was a Fellow of the Royal Society of Canada, a tenured professor at Western University Law School, an Ontario Queen’s Counsel and Counsel at the law firm Cohen Highley LLP in London, Ontario. Professor Fridman was awarded the Walter Owen Book Prize for distinguished writing on Canadian law upon the publication of the first edition of The Law of Torts in Canada and the David W. Mundell Medal. Professor Fridman enjoyed a number of appointments during his distinguished legal career. He held academic positions at the University of Adelaide, University College at the University of London, the University of Sheffield, the University of Alberta (where he was also Dean of the Faculty of Law from 1970 to 1975) and Western University. He was also a visiting distinguished professor in the Faculty of Law at the University of Hong Kong, the University of Sydney, the University of Western Australia and the University of Tasmania. 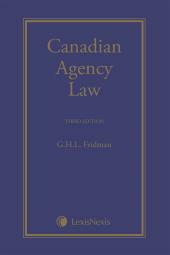 During his legal career, Professor Fridman was a Director of the Institute of Law Research and Reform in Alberta, and a member and researcher for the Contract Law Reform Project of the Ontario Law Reform Commission. In addition, he was Editor-in-Chief of the Ontario Reports in 1992 and 1993. In addition to his passion for the law, Professor Fridman was a lover of music, theatre and travel, and had visited more than 100 countries.